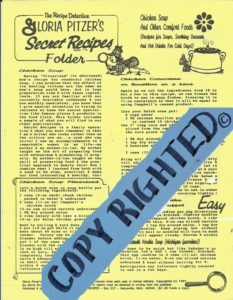 Secret Recipes – Page 3 – Because great recipes need to be shared! 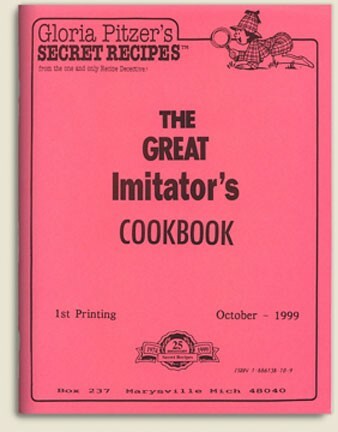 1999 – The Great Imitator’s Cookbook was written, illustrated and published by Gloria Pitzer (Secret Recipes, St. Clair, MI). 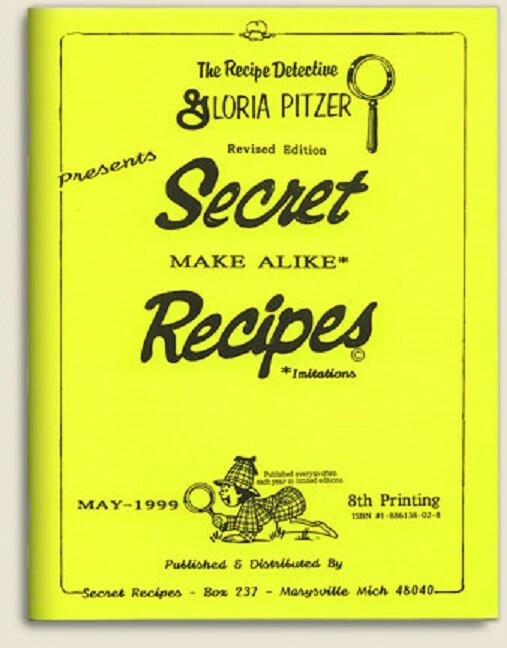 NO LONGER IN PRINT – this cookbook has a collection of 367 copycat recipes on 60 pages in an 8.5” x 11” format, which are complimented by Gloria’s signature style of “recipes” for being the best we can be in our daily relationships tucked in between! 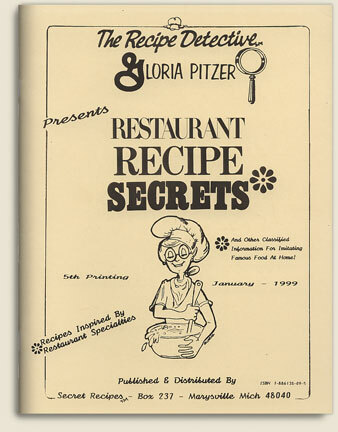 1997 – Gloria Pitzer Presents Restaurant Recipe Secrets was written, illustrated and published by Gloria Pitzer (Secret Recipes, St. Clair, MI). NO LONGER IN PRINT – this cookbook, having 60 pages and an 8.5” x 11” format, includes “Our Story” & information about our family, The Donahue Show phenomena (pgs. 16-17)… plus, imitations of products and dishes from Kraft, LA Choy, Cracker Barrel, Bob Evans and Ponderosa…ingredient substitutions as well. 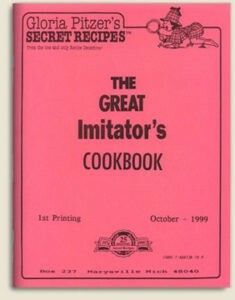 In the old days, chefs were flattered when asked to share a recipe. 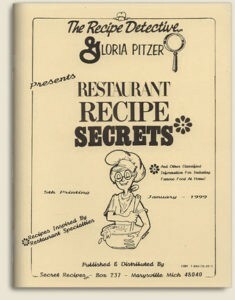 But, now, they can’t afford to give out the secrets that make their dishes special and unique. 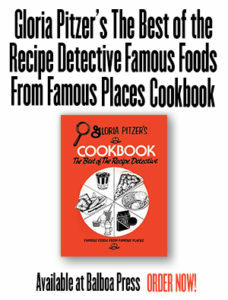 That’s where Gloria comes in, as she attempts to figure it out, following her hunches on which ingredients will probably produce an identical flavor or similar texture to the famous product or dish. 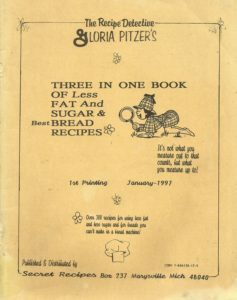 I’ve collected many of Gloria Pitzer recipe books and bulletins since 1977. She is great and right on in duplicating many recipes. 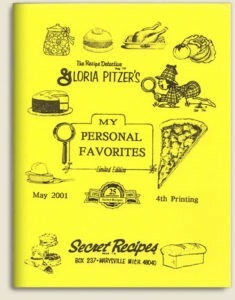 I loaned out “Sugar Free Recipes” (1987-88) book and am searching for a replacement as it is out of print. 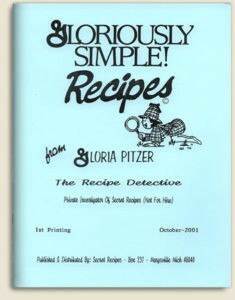 I was happy to find many of her books on the Internet. 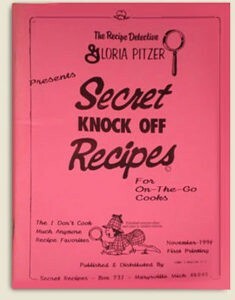 I’ll keep searching. 1995 – Gloria Pitzer Presents Secret Knock Off Recipes was written, illustrated and published by Gloria Pitzer (Secret Recipes, St. Clair, MI). 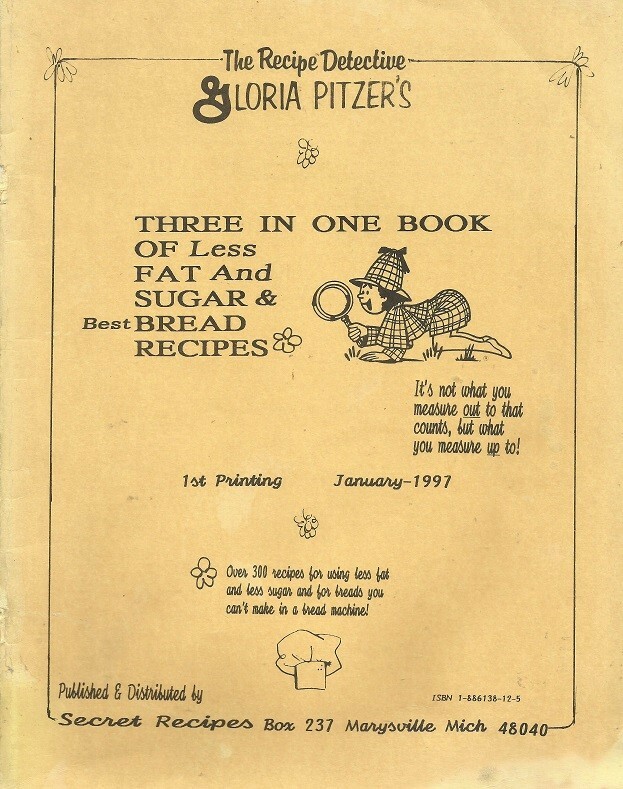 NO LONGER IN PRINT – this cookbook boasts a little of this & a little of that! 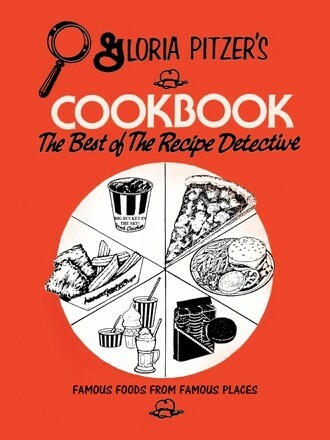 You’ll find 352 copycat recipes of famous foods from even more famous places not included in her other books; amid Food-for-Thought, household tips, cooking tricks and humorous quips – all in a 60-page, 8.5” x 11” format. 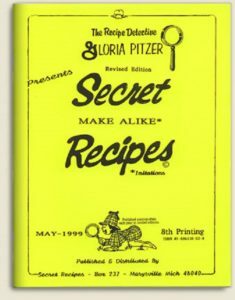 In this book, Gloria Pitzer draws a parallel between most of the recipe secrets she shares with you here and those dishes we’ve all enjoyed while eating out or products we all buy at the supermarket. 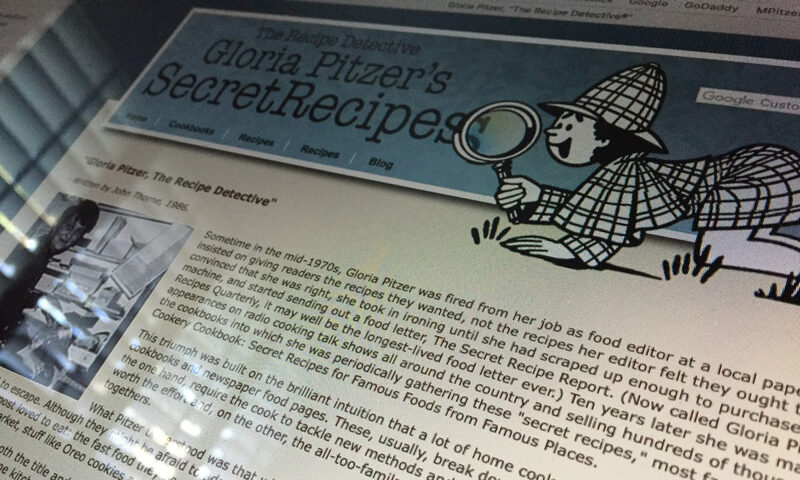 The food industry’s secrets are closely guarded by a very competitive market; but, Gloria’s recipe imitations unbreak the codes and unmask the mysteries of dining in as if we are eating out!